After the massive earnings of 2012’s Skyfall, could 2015’s SPECTRE continue to produce record receipts for the James Bond franchise? No – while it did more than adequate business, Skyfall became the franchise’s biggest worldwide success, so SPECTRE just couldn’t compete. In my opinion, the same goes for the movie itself. 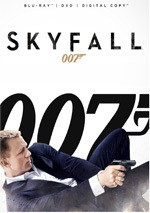 Skyfall wasn’t the best Bond I’d seen, but it was very good. SPECTRE, on the other hand, shows a step back in quality. At the film’s start, James Bond (Daniel Craig) stops a terrorist bombing in Mexico City and eventually kills assassin Marco Sciarra (Alessandro Cremona). Along the way, Bond nabs Sciarra’s ring, a piece of jewelry that sports an unusual stylized image of an octopus. Though his boss “M” (Ralph Fiennes) suspends Bond, 007 disobeys orders and goes to Sciarra’s funeral in Rome. There he meets Sciarra’s widow Lucia (Monica Bellucci), and she relates information about SPECTRE, the secret organization to which the assassin belonged – and the source of the octopus ring. 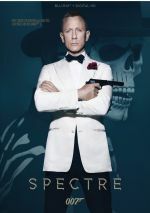 Bond attempts to infiltrate SPECTRE and this takes him toward a showdown with Ernst Stavro Blofeld (Christoph Waltz), the organization’s leader – and also someone from Bond’s past. Star Trek fans know about the “odd/even rule”, one that states the franchise’s odd-numbered films stink whereas the even ones prosper. Through four films, the Daniel Craig Bonds show the opposite trend: the odd-numbered efforts work well while the even flicks struggle. This pattern appeared most extreme with the first two Craig efforts. 2006’s Casino Royale remains the best of the four, and 2008’s Quantum of Solace still flops the worst. Heck, Solace might be the crummiest Bond of all-time. SPECTRE doesn’t remotely approach that dubious distinction, for whatever flaws it demonstrates, it still offers a substantially more satisfying experience than the anonymous Solace. Nonetheless, SPECTRE gives us lackluster Bond, and it comes as a big drop-off after the satisfying Skyfall. Part of the problem comes from the film’s pacing, as it just seems to drag a lot of the time. I get that it wants to build its villain and other new characters, but it comes across as slow and dull during too much of the expository periods. Not that SPECTRE skimps on action, as it actually provides quite a few potentially dynamic set pieces. However, these tend to feel somewhat gratuitous, as the movie would prefer to focus on its characters but it presents a chase here or a hand-to-hand fight there to throw us a bone. This criticism is probably too severe, as I don’t want to leave the impression that SPECTRE comes as a snoozefest. The movie does kick into middle gear at times, and it can be moderately interesting. As semi-half-hearted as much of the action may seem, at least we get a fair amount of it – and unlike the Jason Bourne-styled material in Solace, SPECTRE manages to “feel like Bond”. Maybe a little too much, actually, as SPECTRE occasionally veers toward self-parody. The movie gives off something of a “greatest hits” feel, as some scene reflect prior glories more than they should. I won’t say that SPECTRE directly quotes earlier Bonds, but it nods toward them in a way that makes it come across as less than original. Really, can we view Hinx (Dave Bautista) as anything other than a blatant attempt to update Odd Job from Goldfinger? Mainly it’s the lackluster nature of the narrative that disappoints, though. Given the prominence Blofeld enjoys in the Bond franchise, one expects a truly dramatic reintroduction here, but that doesn’t occur. This stems partly from the movie’s ill-advised decision to give Blofeld a backstory that connects him to Bond. To avoid spoilers, I won’t discuss that in detail, but I think the plot point falters. It feels more like something out of an Austin Powers movie and it seems unnecessary anyway – we already invest in the animosity between Bond and Blofeld, so we don’t need added “drama”. I mostly like Waltz as an actor, and on the surface, he feels like a good choice to play Blofeld. However, I think he falls flat. He just doesn’t demonstrate the cool menace we expect from the character and he fails to connect to the part. Waltz’s Blofeld doesn’t flop, but he falls short of expectations. As does much of SPECTRE. We get a bland leading lady, a sluggish story and mostly mediocre action. Add to that some ham-fisted political messages and this becomes a decidedly lackluster Bond adventure. I won’t call it bad – and it certainly betters the worst from the franchise – but it never develops into anything particularly interesting. SPECTRE appears in an aspect ratio of approximately 2.40:1 on this Blu-ray Disc. Expect a fine presentation here. Sharpness looked positive. Nary a smidgen of softness interfered, and the movie consistently seemed concise and accurate. Neither jagged edges nor moiré effects appeared, and I saw no edge haloes. Print flaws also failed to manifest themselves. The film’s palette followed a predictable path. The Mexico City opening sequence opted for a heavy sandy feel and after that the movie mainly chose orange and teal. Within stylistic constraints, the hues seemed well-depicted. Blacks were dark and deep, with good depth. Shadows also came across as smooth and clear – an important factor given how many low-light scenes showed up here. Overall, this became a strong image. I also felt pleased with the movie’s DTS-HD MA 7.1 soundtrack, as it added a lot of power to the tale. The soundfield presented an active and lively piece that frequently engaged the various speakers. The film showed distinctive imagery throughout the movie that placed different auditory elements accurately within the spectrum and meshed them together nicely. Music provided strong stereo imaging, and effects popped up from the appropriate locations. Quieter scenes displayed natural ambience, while the many action pieces involved engrossing and vibrant imaging. The Mexico City opening seemed especially good, but the whole movie utilized the channels in a compelling manner. Despite the film’s high profile, SPECTRE comes with a surprisingly light collection of extras. Bond’s Biggest Opening Sequence runs 20 minutes, 12 seconds and includes comments from director Sam Mendes, 1st AD Michael Lerman, producers Michael G. Wilson and Barbara Broccoli, production designer Dennis Gassner, costume designer Jany Temime, Mexico line producer Stacy Perskie, Mexico costume supervisor Anna Terrazas, costume supervisor Kenny Crouch, crowd makeup artist Hayley Barkway, crowd hairdresser Polly Coxon-Smith, makeup designer Naomi Donne, crowd hair supervisor Tracey Smith, choreographer Priscila Hernandez, art director Ben Collins, stunt coordinator Gary Powell, special effects supervisor Chris Corbould, fight coordinator Olivier Schneider, helicopter pilot Chuck Aaron, location manager Ali James, and actors Daniel Craig and Stephanie Sigman. As expected, the program covers a mix of elements involved in the creation of the movie’s opening sequence. A lot of this tends toward praise/happy talk, but we still get a decent look at the way the crew brought about the scene. Six Video Blogs fill a total of nine minutes, nine seconds. Across these, we hear from Mendes, Corbould, Powell, Lerman, Broccoli, action vehicles technical coordinator Neil Layton, 2nd unit director Alexander Witt, singer/songwriter Sam Smith, special effects floor supervisor Ian Lowe, explosives supervisor Charlie Adcock, and actors Dave Bautista, Lea Seydoux and Monica Bellucci. These cover story/characters, vehicles, stunts and effects, and the theme song. A handful of good details emerge, but these clips remain promotional more than anything else. In addition to three trailers, we get a Gallery. It offers 18 shots from the set. The photos look fine but don’t offer more than promo images. At nearly two and a half hours, SPECTRE becomes the longest Bond film to date, and the added running time doesn’t suit it well. Though the movie shows occasional glimmers of life, it tends to feel slow and without much real excitement. The Blu-ray offers excellent picture and audio but skimps on supplements. While not “bad Bond”, SPECTRE seems decidedly lackluster.